When I submitted my 50,026 words that the word count tool on my Open Office program said I had written, NaNo’s word counter disagreed. It said I only had 49,528 words. So it was back to the computer for another hour and a half yesterday to insert an extra scene into the first horrible draft of my murder mystery. 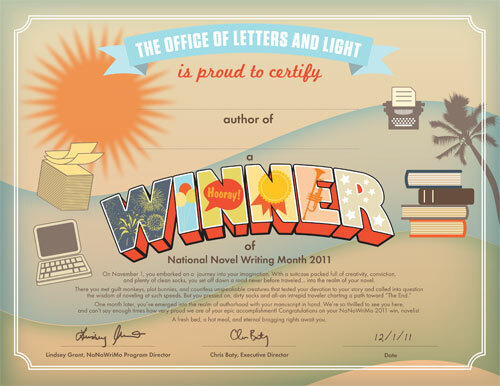 But the next time I submitted the novel for verification, the NaNo word counter told me I was a “winner.” And Indeed I felt like one. While the book, if I choose to go forward with it, needs a lot of work, it is complete and it does have things in it I like. It is the first fiction book I’ve ever written in first person. While the main character, who is 28 years old, is not me, I realized as I lay in bed last night that I had her wondering where she was going to settle down and find herself. It’s a question that at 72, I’m coming to grips with myself. It felt funny realizing that connection only last night. The main character’s name is Carnegie Hall, Carny of course for short. Her musician parents played around in a practice room at Carnegie Hall and she was their little souvenir. Nothing of me there. But she inherits a dog that has a lot of similar traits to my canine traveling companion, Maggie. I even named the dog Maggie. As I wrote I used bits and pieces of people I knew and both their and my own experiences in many instances. I also let my environmental awareness play a role. It’s a book with a Texas Gulf Coast beach setting where a Ridley sea turtle comes to nest and where Carny, an artist, paints shore birds. I learned many things from this intensive writing experience. And while it would be great if I had learned these things at a younger age, it’s always better late than never. Of all the many resolutions. I’ve made in my life, most were broken within the first week. This time I stayed true to myself. There’s a lot to be said for finishing a project once started. Besides daily writing, as writers should do, I also learned to say the word “No” to things that interfered with my morning ritual. I already knew from long experience that If I don’t write first thing in the morning, I don’t write. Thank you NaNo for challenging me. And congratulations to all you other NaNo winners out there. I’d love to hear how you made the journey. Thanks Bob and Len. It was really worth the effort. Fabulous, Pat! Congratulations on hard work paying off. congratulations for riding right through the potholes and coming out on top! on December 1, 2011 at 4:18 am | Reply Dani G.
That is such an accomplishment, Pat! Thanks Dani and Mariana. I especially like the pothole comment. Well done Pat, I’m pleased for you and impressed with your dedication to the cause. Way to go! Now, don’t stop your routine — keep writing! What a great compliment. Thank you. CONGRATULATIONS! That’s such a huge accomplishment- and to have done it in just one month; wow. 🙂 Way to go!